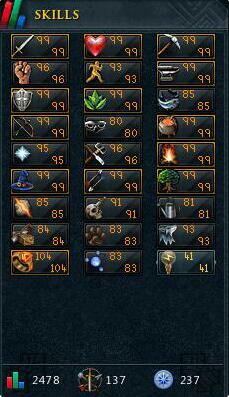 We always provide the most perfect RS 3 account. 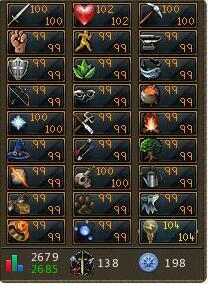 Like high grade account, ranger account, magic account, Pk account, pure account, comprehensive grade account, as so on. As long as you have needs, we can do it, just name it! Let you become RS leading. When you place the order, Please go to live chat get your new runescape account or contact our live chat support. Don’t worry, if you have not enough time to wait in live chat, you can leave telephone number for ur order and call you coming to get it when ready. Level137, ATK:99, STR:96, DEF:99, RNG:99, MAG:99, summoning:93, PRA:95, slayer:91, herblore:99, runecrafting:85, dung:104, TotalLevel: 2478,QuestPoint:237.